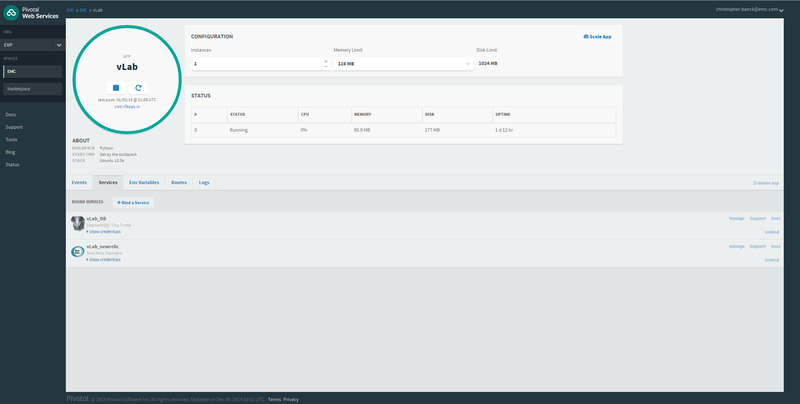 In this post I’ll describe the required steps to configure a Django Pyhton Application for Cloud Foundry. Cloud Foundry (CF) is an open source Platform as a Service (PaaS) solution developed mainly by the company Pivotal. Cloud Foundry is controlled by the Cloud Foundry Foundation where, among others,EMC, VMware, IBM and SAP are members. Similar to Open Stack there are commercial products of Cloud Foundry like Pivotal Web Services, Pivotal CF and IBM Bluemix. You can get a 60 Day free trial for PWS. All of the above services also offer a free service plan for limited usage. For my example I leveraged ElephantSQL and New Relic. How to use New Relic will be described in a later post. Buildpacks provide framework and runtime support for your applications. 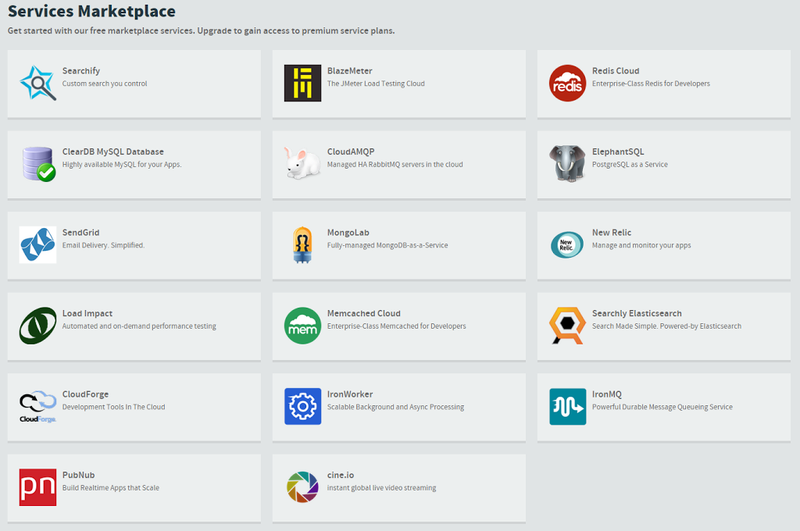 Currently Cloud Foundry provides buildpacks for Go, Java, Node.js, PHP, Ruby and Python. All buildpacks, beside the Java one, are based on Heroku buildpacks. Heroku is also a platform as a service (PaaS) but not based on Cloud Foundry. It is also possible that you create your own buildpack or e.g. use one that is shared on GitHub. The biggest difference between CF and Heroku is, which made me struggle, how they differently handles environment variables to inject information, like database connection information, into the container at runtime. For example does Heroku add an environment variable (config var) “DATABASE_URL” for the database connection string (e.g. “postgres://foo:foo@heroku.com:5432/hellodb”) or “NEW_RELIC_LICENSE_KEY” for the new relic license key. In contrary does Cloud Foundy add an environment variable “VCAP_SERVICES”, which is formatted in JSON, and stores all information for connected services. Cloud Foundry also offers the ability to create custom environment variables additionally . These variables can store any kind of strings. There has to be a “but” – it seems there is one exception in Cloud Foundry. Beside the “VCAP_SERVICES” environment variable CF is creating a “DATABASE_URL” variable based on the “VCAP_SERVICES” one. Sadly I haven’t found any documentation for the Python buildpack but the variable is mentioned in the documentation for the Ruby buildpack. In a later post I will describe how to handle the missing “NEW_RELIC_LICENSE_KEY” for the New Relic configuration. The “runtime.txt” specifies which version of Python should be loaded. A list of supported runtimes can be found on GitHub. The most obvious package we are loading is Django, our Python Web framework. WhiteNoise is used to serve static files and Gunicorn is used as our Python WSGI HTTP Server. For the Python PostgreSQL adapter I use Psycopg2. And finally dj-database-url is used to simplify the usage of the “DATABASE_URL” environment variable in the Django “settings.py”. If you want to use a MySQL database you will have to replace psycopg2 with mysqlclient “mysqlclient==1.3.4” (supports Python 3). The third and last file “Procfile” is used to define what should be started in the instance. This “Procfile” is going to start the python application “myapp” using gunicorn with two workers. “myapp” will have to be replaced by the name of your application. Before we are able to publish our django application to Cloud Foundry we have to modify “settings.py” to use the “DATABASE_URL” for the database configuration and the “static” variables to use WhiteNose for serving our static files. The function “dj_database_url.config()” loads the “DATABASE_URL” and transforms it into the django format for configuring the database setttings. Please note that the buildpack will automatically run “manage.py collectstatic” to collect the static files from all of your applications. “wsgi.py” has to be modified to use WhiteNose for serving our static files. Please make sure that you replace “myapp.settings” with the name of your application. Once the application is deployed to Cloud Foundry, which I’ll show in a minute, we need to create the database tables and the admin user. On heroku you can simply use the heroku cli to run any command in an “One-Off Dyno“. Cloud Foundry currently does not support a way to run a shell command in an easy way. The only option is to run once a custom script, instead of using the “Procfile”, the first time you push your application to Cloud Foundry. echo "------ Create database tables ------"
echo "------ create default admin user ------"
echo "------ starting gunicorn &nbsp;------"
The last and fun part is to push the application to Cloud Foundry. To be able to push an application easier we create a manifest file which describes the application. We give our application a name, how many instances we want to start, its memory requirement and lastly the name of our database service which we want to bind. Finally we are ready to push our application using the Cloud Foundy CLI. cf push --no-route -c "bash ./init_db.sh"
With the first command we login into the Pivotal Web Services. The command will ask you for your username and password. Next we create our PostgreSQL database. “elephantsql” is the name of the PostgreSQL service (see the picture of the service marketplace) and “turtle” is the name of the free plan. If you deploy your app for the first time you will have to run our “init_db.sh” script once and then push your app again but without specifying the script. Now your django application should successfully run on Cloud Foundry!!! 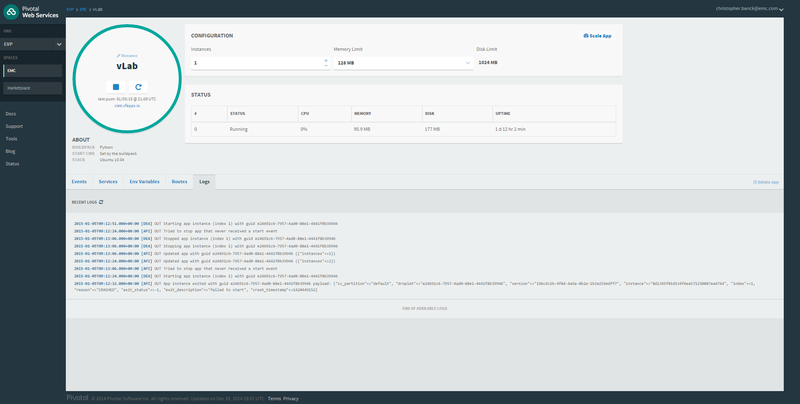 In one of the next posts I will describe the required steps to uses New Relic on Pivotal Web Services with Python. Right post at right time 🙂 Thanks for detailed steps, it is very clear and helped me a lot. One comment though, while pushing the app to cloud foundry, i think the buildpack reference is missed. Don’t we need to use “-b” option and specify buildpack path? Thx. 🙂 You don’t need to specify the buildpack as it should be supported by default. Try “cf buildpacks” and look for “python_buildpack”. 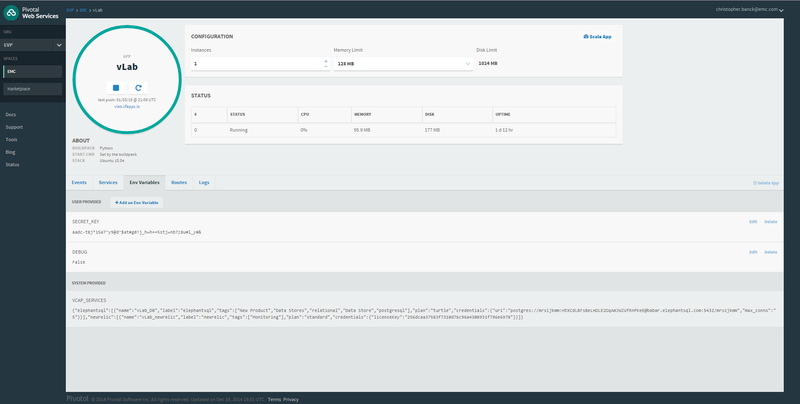 While pushing Cloud Foundry will detect that it is a python app and load the correct buildpack. This was excellently helpful, particularly using whitenoise and the bash script for initialising the database and user. Very nice and detail explanation gives clear idea. Could you please tell how to call database script as it’s not getting invoked? I am using python 2.7.11 i want add mysql database .what are changes i have to do?